A few years after the birth of the web, we embarked on a research project to study the questions people asked in online medical forums. We studied thousands of questions people had posted in forums related to chronic diseases. As our research progressed, we noticed a pattern starting to emerge. People’s questions changed based on where they were in their journey with a particular disease. For example, if the person was recently diagnosed, they had all sorts of questions about what the disease was and its implications on their lives. Whereas, if they were well within their treatment process, many of their questions had more to do with those treatments. In our analysis, we found a dozen different chronic illness stages. In each stage, a person’s questions changed. They would need different information to manage their illness and live a quality life. Now it seems very obvious to us that people’s needs changed as their life with the illness progressed. Yet, at the time it wasn’t obvious at all. Websites providing medical information were constructed like encyclopedias that never took an individual user’s needs into account. Through our research, we stumbled into creating a framework around a patient’s progress with chronic illness. We could use the patient’s progress framework to make sure we saw the entire picture. What we found was that many information providers only focused on a couple of the stages. People newly diagnosed and those living with the illness were missing answers to their important questions. Using the framework, we could ensure we knew what questions to address and how to structure the information. Over the years, we’ve learned about other frameworks. 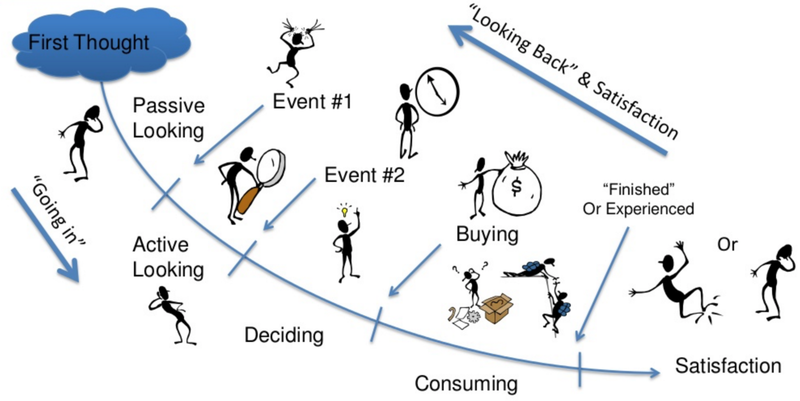 Bob Moesta has popularized a great framework that shows how shoppers progress through a purchase. It starts before the shopper even realizes they need to buy a new product and progresses up until the new product owner is getting benefits from their purchase. At each stage of shopping progress, the shopper needs different information about how the product will benefit them. Teams can use this framework to ensure they answer all the shopper’s questions, before the customer even asks. Anthony Ulwick also has a framework he calls the Job Map. He uses this framework to map out how a customer meets an unmet need. It’s brilliant because, like Moesta’s framework, it starts before the customer has the unmet need. Then, in eight steps, it walks through the stages until the customer no longer has that need. 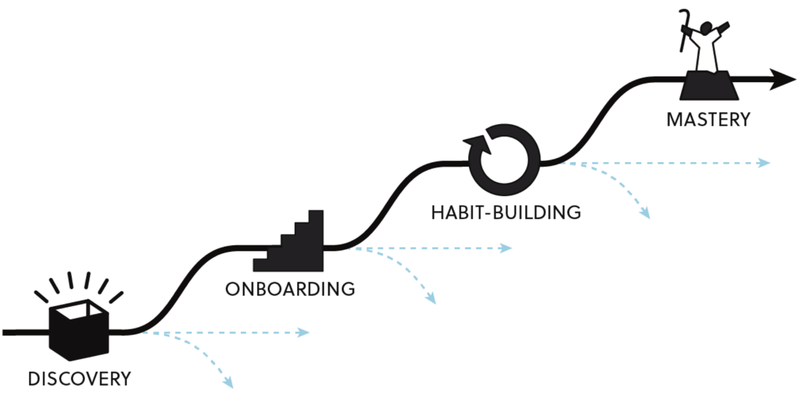 By studying their users at each stage, teams can learn how the customer’s specific needs transition. Amy Jo Kim has a 4-stage Mastery Path she uses to describe how users learn new products. It extends beyond the oversimplified notion of novices and experts, and is based on her extensive research into how people learn to play and become immersed in online games. Like the other frameworks, Kim’s shows that the user’s needs change as they progress through each stage. The needs they have when they’re first onboarding with the product is different than when they’re later mastering advanced capabilities. Teams can use her framework to ensure they’re covering the full lifecycle in their research. If we want to produce competitive, innovative solutions, we need to uncover needs that none of our competitors are addressing. In most cases, we don’t need to invent something brand new the world has never seen. Instead, let’s only look in places where our competitors aren’t looking. We use a progress framework to tell us where to start looking. In most industries, competitors just copy other competitors. User research can become our competitive advantage, especially when we’re using a progress framework to focus where nobody else has explored. When we understand our users needs better than everyone else, we can be the market leader everyone else chooses to follow. This is how we’ll deliver better quality products and services than our competition. In our Creating a UX Strategy Playbook workshop, we spend the first afternoon taking a deep dive into how to make user research a competitive driver in your organization. You’ll walk through more than a dozen alternative approaches, including using customer lifetime journeys and progress frameworks, to uncover critical customer unmet needs before your competitors do.